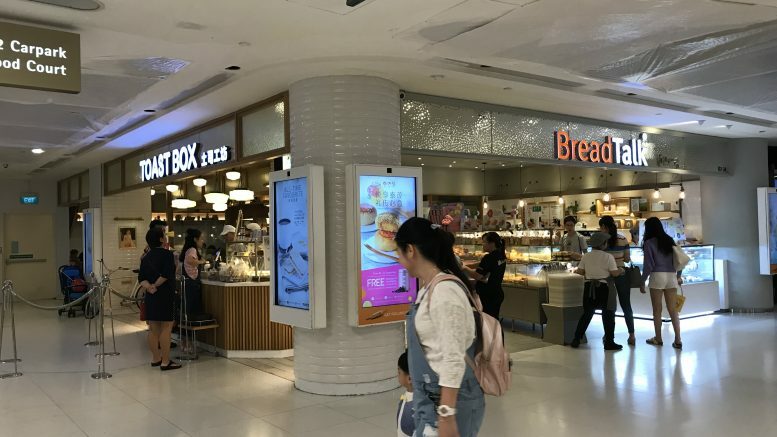 BreadTalk and Toast Box outlets at Singapore’s VivoCity mall; taken September 2018. Singapore telco M1 said on Monday that its CEO Karen Kooi Lee Wah, age 64, has retired, effective 6 December, with sector veteran Manjot Singh Mann, age 53, tapped to replace her. Singapore’s iconic bakery chain BreadTalk reported its net profit for the third quarter dropped 29.2 percent on-year to S$2.70 million amid one-off expenses for its new business investments. CapitaLand said on Wednesday that its four residential launches on the mainland over China’s traditional high season for new home sales, called the “Golden September Silver October,” sold a total 1,506 units with a value of around 2 billion yuan, or S$396.7 million. Singapore Exchange said mid-day Monday that it planned to sign two memorandums of understanding, one with Zhejiang (S) Entrepreneurs Association (ZJEA) and another with China Futures Association (CFA), to strengthen its ties with China as part of its growth strategy. The agreement with ZJEA, a non-profit organization with ties to enterprises in Zhejiang and other parts of China, is aimed at developing Singapore capital market opportunities for China enterprises, SGX said in a statement filing to the exchange. The tie-up with CFA is for cooperation on developing the derivatives markets in China and Singapore, in a deal that “renews” an existing partnership set in 2013, SGX said. Frasers Logistics & Industrial Trust reported on Monday that its adjusted net property income for the fiscal fourth quarter rose 52.6 percent on-year to A$49.31 million after recent acquisitions. ST Engineering said on Monday that its aerospace division incorporated Capella 1 Leasing Ltd. and Capella Capital (Ireland) Ltd. in Ireland. Capella 1 will be a holding company for aircraft easing investments and Capella Capital will fund aircraft purchases, it said. Each has a paid-up capital of US$1.00, it said. Rubber chemical maker China Sunsine Chemical reported on Monday that its third quarter net profit jumped 85 percent on-year to 143.4 million yuan on higher revenue and margins. Delong Holdings warned on Monday that it expected to report a “significant decrease” in its net profit for the third quarter compared with the year-ago period. That was mainly due to the absence of a year-ago 377.4 million yuan one-off gain from subsidiary Laiyuan County Aoyu Steel’s sale of production capacity, it said in a filing to SGX after the market close on Monday. China Everbright Water said on Monday that it signed agreements with Laiyang Economic Development Zone Management Committee for the Laiyang Economic Development Zone Water Environment Management Public-Private Partnership Project, or Laiyang PPP project, for a total investment of around 484 million yuan. Yoma Strategic said on Wednesday that signed a franchise agreement with Auntie Anne’s parent FOCUS Brands to bring the soft pretzel bakery franchise to Myanmar’s market. Yoma Strategic Holdings said on Monday that its wholly owned subsidiary, Yoma Strategic Investments Ltd. (YSIL), established a 50:50 joint venture in Singapore called Seagram MM Holdings with Amity Enterprises. Seagram MM will be used in connection with the production and distribution of whisky in Myanmar, it said. The joint venture has issued and paid-up share capital of US$100, comprising 100 ordinary shares at S$1.00 each, it said. Oxley Holdings said on Monday that it increased the issued and paid-up capital of wholly owned subsidiary, Oxley Amethyst, to S$2 million from S$1 million by subscribing to 1 million new ordinary shares at S$1 each. ESR-REIT’s manager, ESR Funds Management (S) said on Monday that it appointed Lawrence Chan Wee Kiat (Chen Weijie), age 43, as its chief financial officer. From May 2012 to October 2018, when ESR-REIT’s merger with Viva Industrial Trust was completed, Chan served as CFO to Viva Industrial Trust Management, it said. OKP Holdings said on Monday that its third quarter net profit rose 9.3 percent on-year to S$800,000, while revenue fell 20 percent on-year to S$21.7 million. It said revenue from the construction segment fell 25.9 percent on-year to S$13.06 million on a lower percentage of revenue recognized as a few construction projects were nearing completion and it had a newly awarded construction project in the quarter. The maintenance segment also saw a revenue decrease 23.3 percent on-year in the quarter to S$7.23 million on a few projects nearing completion and a few newly awarded projects in the quarter, it said. That was partly offset by rental income surging to S$1.39 million in the quarter from S$61,000 in the year-ago quarter on the newly purchased property at 6-8 Bennett Street, East Perth, Western Australia, during the quarter, OKP said. But the gross profit margin rose to 15.8 percent in the quarter from 9.8 percent in the year-ago period, on a few maintenance projects with better gross profit nearing completion, it said. China Environment said on Monday that a China court has auctioned off land-use rights and property assets that its wholly owned subsidiary Fujian Dongyuan Environmental Protection (FJDY) had pledged as security for a 36.67 million yuan loan from Zhongxin Bank (ZXB). The proceeds of the auction were 14.4 million yuan, it said. ZXB will inform the company of the balance amount owed on the loan after the court distributes the proceeds, but China Environment didn’t expect FJDY to be able to repay any outstanding balances due to ZXB, it said in the filing to SGX. ZXB may involuntarily wind up FJDY as a result, China Environment said. China Environment’s shares have been suspended from trade since 2016. This article was originally published on Wednesday 7 November 2018 at 7:31 A.M. SGT; it has since been updated to add an item on Yoma Strategic.